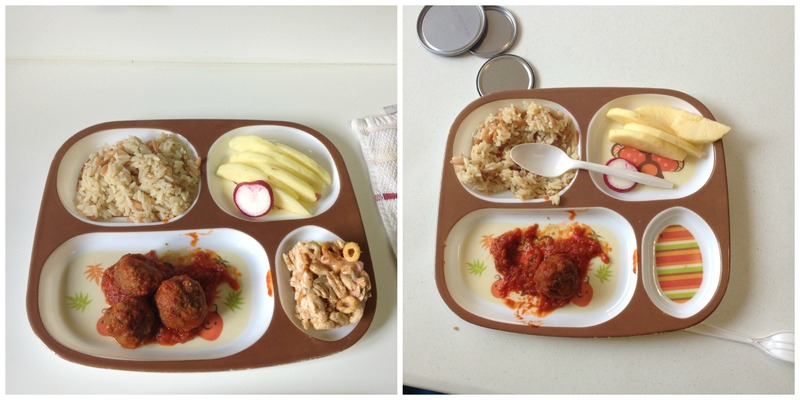 A month or two ago, I started posting my kids’ dinners on Facebook and Instagram. I didn’t mean for it to become a “thing,” but I’ve gotten a lot of positive feedback from people who say it helps them plan their kids’ dinners, so I keep doing it, even though sometimes I feel a little funny about the steadily increasing amount of food pictures on my phone. I really enjoy using my cute plates, arranging the food attractively, and the challenge of getting all the food groups on there. It’s a great feeling when I present my kids with a nice dinner, and it motivates me to keep trying at this whole dinner thing. This is not an area of motherhood which comes easily to me. Most days, by dinnertime, I am ready to clock out. I’m tired, perhaps frazzled, and more interested in writing, music or reading then spending time in the kitchen. I used to just throw something together for the kids because they don’t eat that much anyways. I found it very frustrating to put a lot of effort into a dinner which remained largely untouched. At some point I realized that I really did want/need to put more effort into 1) expanding their food choices beyond pizza and pasta 2) making sure they have a chance at getting the nutrients they need to grow and develop. These may seem like no-brainer parenting values, but really, it’s taken me over four years of parenting to prioritize this. Taking pictures and posting them online is kind of my way of holding myself accountable, because I still would rather clock out for an hour around dinner time and let them fend for themselves. I would. But I can’t. 1. I am doing exciting, well-balanced dinners every single night. I don’t post every dinner I make, and that can give the impression that I’m doing gourmet dinners every night. I am not. Generally, I only post the pictures that I’m proud of, that look the best or the most interesting (to me). Taking a picture of cereal, processed cheese slices and apple wedges just doesn’t thrill me. It’s not pretty, but it’s real. It happens, and that’s okay. 2. My kids actually eat most or all of these dinners. But a lot of the times, they don’t. So, for those of you that see my kids’ dinners and think that they are consistently eating well-rounded meals, let me be transparent about what’s really going on. In the way of many toddlers and preschoolers, my children do not eat much. And they have preferences. None of this is abnormal, and so I try not to stress about it. I read somewhere that if children their age eat one good meal a day, that’s okay (maybe it’s even one good meal every couple days, I don’t remember). Anyways, their pediatrician is not concerned, so neither am I. Over time I’ve learned to make sure that they have not snacked for at least two hours before dinner so that they have an appetite. Dinner is more or less served around the same time every night. Right before dinner is playtime, and the best is when they can run around for a few hours and build up that appetite. When I can, I sit at the table with them and keep them focused on eating (not forcing them to eat, but just keeping them at the table until they’re full). I really try to increase the odds of them eating, but you know what? I can’t control how they’re feeling. My goal is to include a grain, a protein, a fruit and a veggie. I read in the Smithsonian’s food issue that some children need to be offered a new food at least nine times before they will even try it, sometimes. So I always include a vegetable even though I know 99% of the time it will be ignored or outright rejected. At least they know vegetables exist. 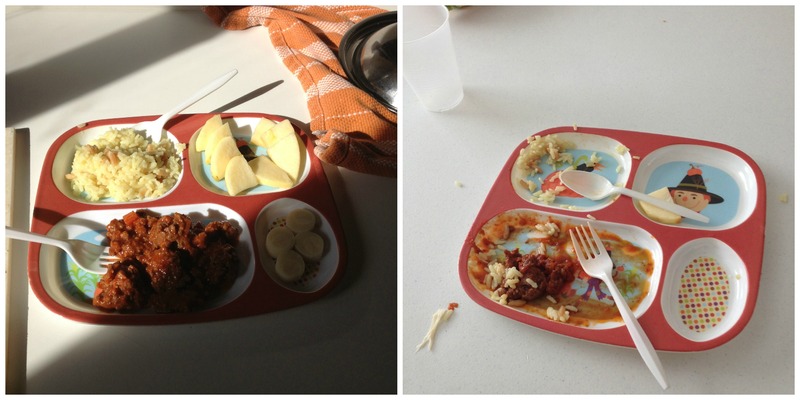 Because pictures can be so instructive, I took pictures of our dinner, both the before and the after shots, for five consecutive days. Even if it wasn’t pretty or interesting. It was a hectic week, and it was very tempting to “start over” on a week when I would have more time, but I wanted to be real about this. Not every week is a good week, and that’s okay. On a happy note, I feel that because I’ve raised the bar for myself, it allowed me to still create fairly healthy dinners on the fly. You know, it’s been like dinner-making resistance training, so even when I skip a day, so to speak, I still have somewhat developed dinner-making muscles. Neat. The meatballs were taken from the freezer, the healthy “rice crispy” treat was leftover from Shabbos. I love Near East brand rice and couscous; they’re tasty and quick to make. Apple slices are also a staple for us, as they’re fairly quick to prep, even with peeling the apples. I knew they wouldn’t touch the radish, but I think maybe they licked it. Pasta and cheese is one of the easiest dinners I make. I finely diced some vegetables in the hope they wouldn’t notice them, and thus eat them. Haha. Not at all. It may have also inhibited them from eating the actual pasta. Corn is from a can. Yogurt is an easy protein to include. As you can see, this dinner was largely untouched. I took the leftover pasta from the previous night (’cause there was a lot of it), and mixed in some pasta sauce and farmer’s cheese. They still didn’t eat it, not really. So they had potato chips. On paper plates. Not my finest hour, but there it is. In a desire to redeem myself somewhat from the previous night, I sautéed some ground beef and added pasta sauce. Near East rice again, apple wedges, and heart of palm slices. It was pretty successful, thankfully. What was even going on this week? I don’t know. I fried some fish for dinner, since I had made couscous-crusted fish the previous week which my kids devoured. This fish, however, not so much. At least someone ate one piece. That’s a bagel with peanut butter (maybe jam, too, I don’t remember). 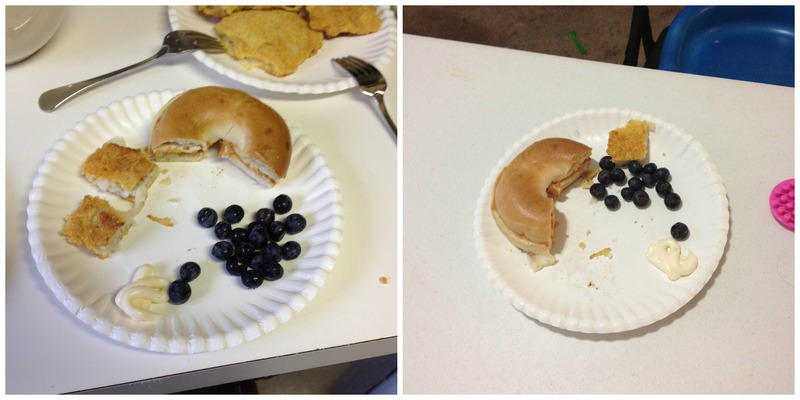 The blueberries, which I thought would go over well, did not. Also, mayonnaise is apparently on the do-not-eat list. Duly noted. There you have it. A more or less average week at our house. If you have kids that really eat nicely, ENJOY! Please feel free to share any tips or tricks you’re learned about getting nutrients into little kids, or any meals that have been particularly successful. If your kids are of the picky persuasion, don’t despair! You can still give yourself 100% credit for trying even if the dinner you made wasn’t consumed. Seriously. Trying is hard when there’s so little “success” to show for it. Also, I want to add that we do give them a daily multi-vitamin. We use Uncle Moishy jellies, and they LOVE them. LOVE! That’s very helpful if they’re not getting nutrients through actual food. I am so glad your kids are good with food. Yay! One of my boys seems to enjoy salad, so maybe I should start including that with dinner, since at least one kid will probably eat it. TechSupport has always been an adventurous eater. I’ve never had difficulty getting him to try different foods, and –like you — I’d read somewhere that it takes kids up to 10 to 15 times to be exposed to a food before their tastebuds adjust to it. The one thing I knew I didn’t want to do was make different meals for different members of my family. I’d seen people do this in their homes and it looked like Crazytown to me. I was very honest with my son when I was giving him something new: I never tried to hide new foods, disguise them, trick him into eating them or make him feel shame if he didn’t like something. I gave him permission to spit things out! You always recommend such excellent bloggers. What’s up with that? Renee is a matchmaker extraordinaire. I have met so many amazing bloggers through her. Seriously, thanks Renee! Very nice to hear about TechSupport! I’m sure his future wife will thank you for a host of things. I used to make a separate dinner for the kids and then for us, and it WAS Crazytown. Oh boy. I was doing it mainly because of my husband’s schedule, but I’m trying to streamline the cooking. It was too much. Haha, no, I totally agree with you. I think that it’s an important thing to teach kids. Our 9 year old daughter eats most things and will at least try anything before she says she doesn’t like it. She eats things that I won’t like avocados and onions, everything but mushrooms. My 2 year old eats pretty well when he feels like it, but our 4 year old is just awful! He won’t put a fruit or veggie in his mouth. He wouldn’t as an infant eating jar food either! If he sees the green of a parsley leaf in a ravioli he’ll ask what it is and declare that he’s full. He’s up to the 19th percentile in growth, which is good considering he was at 12 percent, but we can’t get through to that one about eating! We don’t cook separate meals for anybody unless we’re having something really spicy or outrageous that kids really can’t be expected to eat (very rarely), and we never make them finish their plates. If they’re full they’re full for god’s sake. It sounds like we have very similar four year olds! We have the same “spice” dilemma. If he sees something green, he will declare it “too spicy,” and that’s the end of that. Hear hear on letting them just be full. I’m glad finishing the plate seems to be a thing of the past. I really loved this post, and my baby is only six months! I give you a lot of credit for giving them several different options, and for (sometimes) sitting with them while they eat. The sectioned plates are awesome. I would have also liked to hear what you and your husband had for dinner those nights (did you cook multiple, totally different meals, did you guys eat their untouched food, etc.). And what happens with their leftovers? Those plates are the bees’ knees. I love them, and I got them in the dollar bins at Target, which makes me love them even more. On the first four nights, my husband and I ate what the kids ate. If I’m feeling really good and domestic, I will make a leafy salad as well. I doubt I did that week. I have no idea what we ate that last night. It’s possible we ordered takeout! 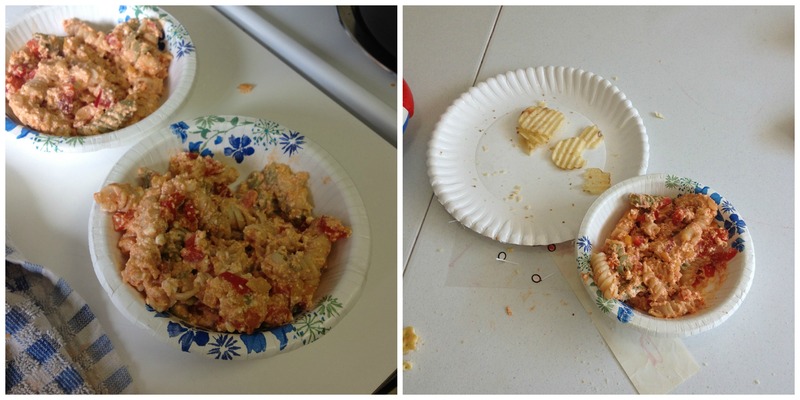 As for the kids’ leftovers, they’re almost always eaten by someone. I will often give them to the baby, or my husband and I will eat them. My husband is not usually around for dinnertime, so sometimes I will snack on the kids’ leftovers to hold me over until I can have dinner with him. Oh yeah… I’ve been trying to remember clever things about making small children eat, but the only thing I remember is: you can’t, unless they want to… I just added one or two child-friendly ingredients to every meal (fruit / pasta / rice / raw vegetables went well) and hoped that the rest would also be noticed and eventually tasted. I didn’t make different meals, we all ate the same stuff (except when the grown-ups had something totally opposed to children’s taste). And I always thought (and still think) it’s important that the family has meals together. Even if the kids don’t eat much or can’t sit at the table as long as mom and dad. I like your dinner creations. Very inventive. Thank you. :) We try. “you can’t, unless they want to” is exactly how it goes. I love the family meal thing, but my husband’s schedule usually doesn’t allow for it, unfortunately. We at least get one whole day of family meals on Shabbos, so that’s nice. It is very important, and there have been studies showing how much of a positive effect it has on the kids, and indeed, the whole family. 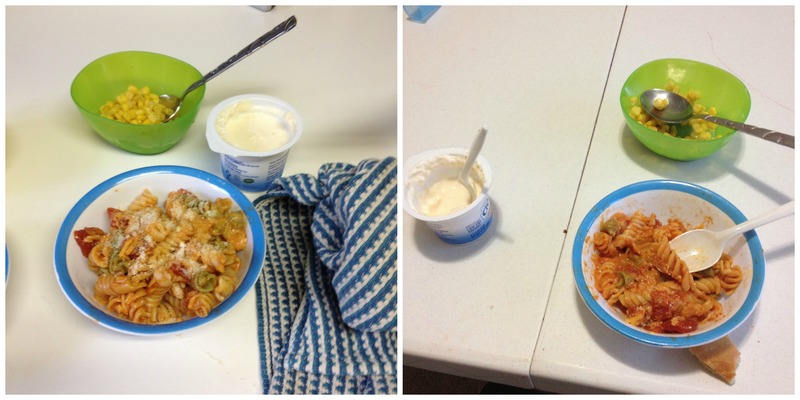 how do you keep your kids at the table – and get them to eat…. some nights are very challenging -i’ve even tried reading a book – but my 2 year old doesnt have the attention span for that…. any ideas???? Oh yes, this is a challenge at our house, too. 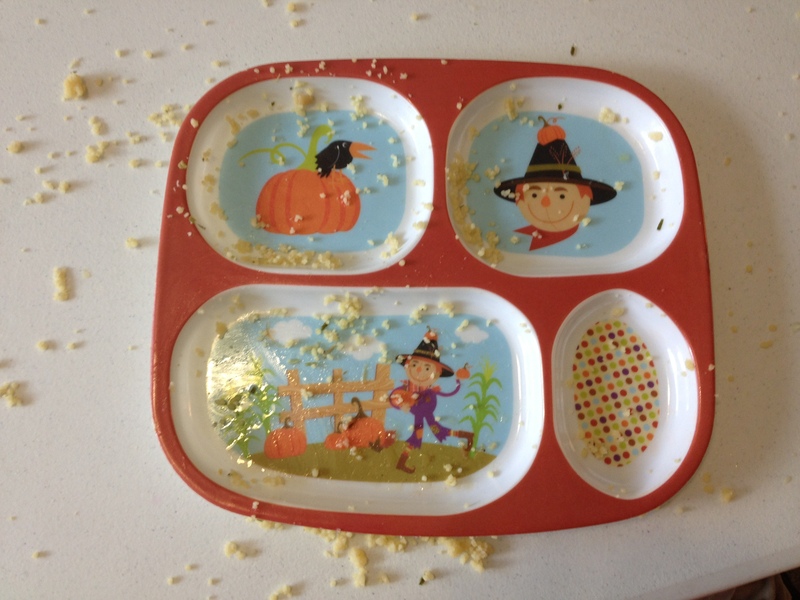 I’ve also tried reading a book, but the most effective thing I’ve found is to give my kids small, concrete directions about eating: “Take two bites of rice. Now take one bite of fish. Now three grapes.” And then I keep telling them what to eat until they tell me they’re full. Sometimes I actually have to feed them. Sometimes they are not even at the table, but playing, and they come back to the table for a bite. I usually try to keep them at the table, but on the night when it’s really a challenge, I just let them play and come back to the table to eat. I haven’t yet started chasing them around with a spoon full of food. I think that’s where I’ll draw the line. Hang in there Mama, you’re doing great! My 2 yr. old only eats string cheese, goldfish crackers and an occasional chicken nugget. Much to my despair since we’re real foodies and do almost all organic food in our house. I’ve tried gardening with him, going to the Farmers’ Market, letting him pick his own food at the store, etc. hoping he’d feel a sense of ownership in his food choices and nada, nothing, zilch. Since the 2 yr. old never eats his meals (I still offer food hoping one day he’ll miraculously eat it) the dog is happy to clean up his leftovers. One other thing, we do breakfast as our family meal instead of dinner. Not sure how your hubby’s schedule is but you might give it a try. It’s easy to make things the night before (breakfast burritos, oatmeal in the Crock Pot, fruit and yougurt, etc.) so the meal is not stressed and rushed in the morning. Oh, I can imagine your frustration! Someday, someday, I hope your son will get to eat your healthy food. Keep on putting it out there and hopefully it will eventually be consumed by him! I really love the idea of breakfast as a family meal. That’s so lovely! Unfortunately, my husband is usually already on his way to work by then, but maybe I’ll start doing that with the kids. Then I would actually eat breakfast instead of just having coffee (it’s a problem, I know!). Enjoyed reading this. I’m at a different stage of life than you – I cook for the adults and let the little ones kind of fit in around it. So they’ll have leftover pasta, or a cream cheese sandwich, or cereal and milk. Meanwhile, we’re eating real food. I look forward to that phase of life! But I’m enjoying this one while I’m in it. :) Thanks for commenting! I love the before/after pictures! Totally reminds me of my own home. I’m so glad to see I’m not alone! It does feel that way sometimes, doesn’t it? Glad to hear about the two oldest kids, and here’s hoping for a third! Although, we’re just happy if they’re healthy, of course. I love your honesty and that you took the after shots, too. So few people do that. What a great illustration. We all have good days and bad days and better days and worse ones in general as parents–and especially in the food we serve them! Concerning “so few people do that”: My theory is that motherhood (or parenthood) is one of the areas in life with the biggest amount of lies being told. It always makes me happy when mothers are just plain honest. I’ll just say this – THANK GOODNESS for this post, because I was starting to think that my kids are the only ones on this planet who only eats well, like, sometimes. Phew. I think you’re doing a great job, Mama! I think we have all been there, thinking our kids are the only ones who – fill in the blank! I think you’re doing a great job, too. Solidarity! I love how honest this post is–and now I no longer feel like a bad mom or a bad cook. Bad mom: when I succomb and make them things they will actually eat–even though they aren’t the healthiest (in my mind at least). Bad cook: struggle to make tasty, healthy dishes–that go untouched (though my self-esteem gets a nick)! You are so welcome! So many of us feel this way, and it’s such a shame. We are all in this together!